The playful approach to learning used in Sesame Street television programs is incorporated into 16 new computer games now available from Apple Computer, Inc. 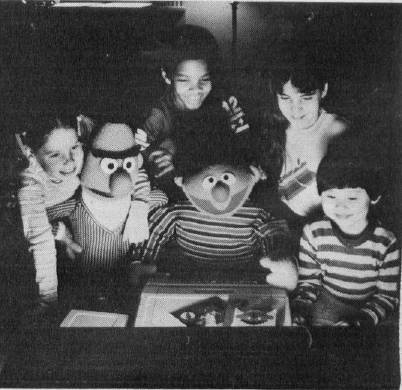 Discovery Games were developed by Children's Television Workshop (CTW), the creators of Sesame Street, for use in the home by children aged 4 to 13. Colorful, animated characters, including the familiar Muppets, and lively sound effects encourage children to practice reading, problem-solving and motor skills, and to use their creative abilities. As they play with Discovery Games, children practice number skills and work with words and sentences. The programs also exercise recall ability, stimulate creativity, and acquaint children with computers. Four Discovery Games packages are available, each containing four games. New computer programs from Apple Computer and the Children's Television Workshop. * Ernie's Quiz, for ages 4 to 7, includes Muppet and number guessing games and a program that lets the child create a face, using game paddles to select from a variety of eyes, noses, and other facial features. * Instant Zoo, for ages 7 to 10, is a set of fast-moving games that encourage quick reactions as the child unscrambles words, spots shooting stars, names animals, and matches pairs of words. A word editor lets the child or parent add word lists to the easy, medium, and hard lists provided in the program. * Spotlight, for ages 9 to 13, includes games that present advanced ideas, such as the way light will angle when reflected off a mirror, and how to guess a three-digit number using clues. * Mix and Match is for all ages, allowing families to play Discovery Games together. The package includes easy games for younger children as well as more advanced programs for other members of the family. Each of the four packages is sold separately at a suggested retail price of $50. The packages include activity booklets of ideas for using the games to exercise the child's imagination and creativity. The programs run on 48K Apple II or Apple II Plus systems with one disk drive. A color monitor or television is recommended. Mix and Match requires Applesoft BASIC, and the other packages require Integer BASIC. Ernie's Quiz and Spotlight also require hand controllers. The games which do not require paddles will run in emulation mode on an Apple III.